Now I’ll be honest: This isn’t an issue that I care deeply about. I believe Paul is taking the wrong tack on immigration; instead of being paranoid about securing our borders against peaceful immigrants (emphasis on peaceful), I believe we should focus on eliminating the government benefits that induce them to come here and drain our tax dollars away. Frankly I believe we should eliminate most of these government-aid type benefits for everybody, but particularly for non-citizens. Then peaceful immigrants would only come here looking for work, which only benefits our economy. Looking at this site, can we really say that, while obviously not one single mammoth government project, the spectre of a “NAFTA highway” speeding people and cargo from Mexico to Canada and points in between is “illusory”? I think that Paul's concerns are legitimate about how the leaders of the three NA nations are working undercover to integrate the three nations into a union. Globalism is not the way to go, especially if we want to keep our national sovereignty. There are already too many business leaders and politicians in America who are selling out our nation for money. Well...yes. It's not loss of sovereignty that I'm not worried about, it's immigration. Globalism is the wrong word here, though, I think; globalism is an economic force that means that, among other things, we buy things that are produced all over the world. That's a good thing. I agree, though, that the kind of supra-nationalism that Paul hinted might be going on is a bad thing. But a road, in and of itself, is not a symptom of any such thing. both posts above are smart. And i feel that the second one clears it up a bit. Thanks for sharing your thoughts so well. "But a road" IS evidence of something, right?!! How does a road, "a superhighway" between Canada, US, and Mexico, that would presumably promote trade and commerce between the three nations be alarming? If trade is promoted between U.S. and Mexico, would it not help the economy of both countries, and if the economy of Mexico is enhanced, would it not help to remove one of the underlying causes for illegal immigration from Mexico? You're not wrong, Tatung. The issue is not the road itself. It's the idea that it is happening without the consent of the people; that is, this is happening because of NAFTA, not because the States involved have chosen to build it. And there's the fact that this project is apparently being kept secret. My issue isn't actually with the idea of immigration or the Road itself; it's with people accusing Paul of making up conspiracy theories. The only idiot here is the one who wrote this article. PLENTY of facts that makes this entire commentary idiotic. Richard, I'm not sure of your position here. 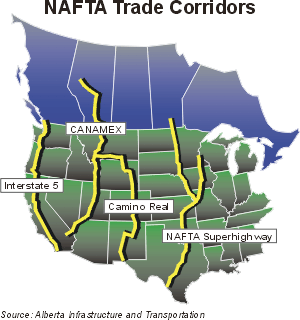 Are you saying that it's idiotic that I'm showing that there's evidence for a NAFTA Superhighway?